Don’t let Xfinity keep you from enjoying the best soccer leagues in the world like LaLiga and Ligue 1, MotoGP, MotoAmerica, WTA, MMA, and other world-class sports. beIN SPORTS and beIN SPORTS en Español regret to report that, despite our best efforts to reach a fair agreement, XFINITY has dropped both stations from its channel lineup. This means XFINITY will no longer provide viewers access to the world-class sports programming offered by beIN SPORTS and beIN SPORTS en Español. 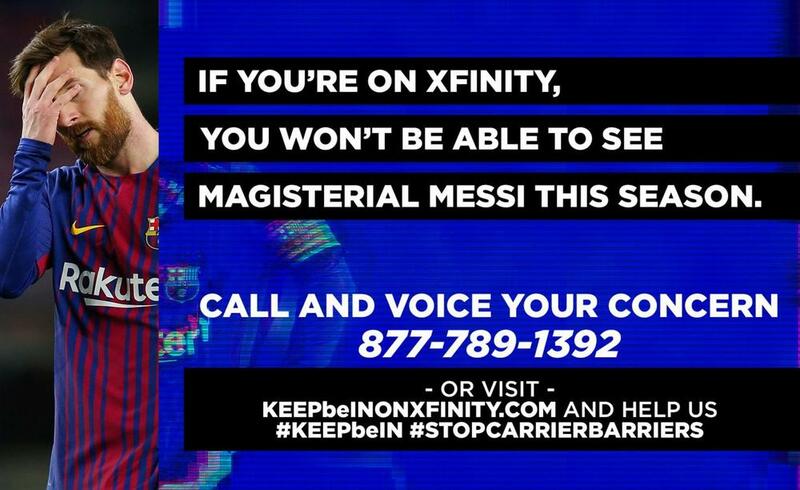 Subscribers who would like to keep beIN SPORTS and beIN SPORTS en Español can visit Keep beIN on XFINITY or call 1-877-789-1392 to file a complaint to their cable provider directly. Your support can make the difference #KeepbeIN #StopCarrierBarriers!